Both of the stories on this DVD are based on previously published works of prose fiction. The two-part Human Nature / The Family of Blood is adapted by Paul Cornell from his 1995 New Adventures novel Human Nature. 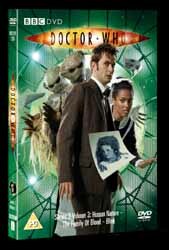 The Tenth Doctor (David Tennant) and Martha (Freema Agyeman) assume the roles played by the Seventh Doctor and Bernice in the book. The main difference between the book and the television story is that in the novel the Doctor seeks human form in order to better understand the human condition, whereas on television he is hiding from the Family of Blood. The villains of the book are a family of Aubertide shape-shifters, who also provide the device that transforms the Doctor into a human (as opposed to the TARDIS's chameleon arch, used in the television story). However, the Family's plan is similar to that of the Aubertides: they want to gain the Time Lord's abilities by obtaining his bio-data module (which takes the form of a cricket ball in the book, rather than the pocket watch seen on television). Though the two-parter is set in 1913, while the novel takes place a year later in 1914, the setting in both cases is a boys' school. And although Joan Redfern is a science teacher in the novel but a school matron (played by Spaced's Jessica Hynes) in the television episodes, in both stories she is widowed, becomes Smith's love interest and disapproves of teaching the boys to fight. Pupil Timothy Dean is renamed Latimer (Thomas Sangster) for television but his role and character remain essentially the same. This does pose a problem for fans such as me, who like as much of Who as possible, be it on television, in print or on audio, to take place within the same universe. However, our own Johnny Fanboy has crafted a cunning explanation for all the coincidences (which is far too complex to go into here). It's a small price to pay for the pleasure of seeing this magnificent tale brought to life on the screen. The romance that develops between Smith and Joan is both touching and comical in a Back to the Future - Part III kind of way. Meanwhile, the Family of Blood and their scarecrow slaves are superbly sinister, particularly Harry Lloyd as the sneering possessed Baines. The chameleon arch reminded me of the transformation arch used by the Navarinos in Delta and the Bannermen. If it hurts as much as the chameleon arch hurts the Doctor in Human Nature, I can understand why Murray was reluctant to use it! In a far more overt tie-in with the original series, we see classic Doctors depicted in the context of the new show for the very first time, as sketches in Smith's notebook. The second part of the story, The Family of Blood, doesn't quite live up to the magnificence of the preceding one. Ten minutes from the end of the episode, Cornell seems to run out of plot, and the rest of the show is taken up tying up loose ends and saying goodbye to people. In the case of one particular character (and in case you haven't seen the episode, I won't say which one), there are actually two goodbyes. At least it doesn't drag as much as the ending of the series finale, The Last of the Time Lords. When he finally reappears, the Doctor comes across as a little too dark and wrathful for my liking. This aspect of the show is more in keeping with the Machiavellian Seventh Doctor than the Tenth. However, this is still a thrilling and moving instalment, especially when it comes to Tennant's performance as Smith. Throughout the story, he is a very different character to the Doctor, but with little flashes of the Time Lord showing through from time to time (such as when he uses the cricket ball to save a baby's life). When he realises that he must sacrifice his own existence in order for the Doctor to return, Tennant acts his socks off, exuding both terror and a passionate desire to live. Despite its flaws, The Family of Blood is still bloody good. In an old abandoned house in 2007, the Weeping Angels wait. When people start disappearing, a young woman called Sally Sparrow finds cryptic messages sent from 1969 by a mysterious stranger known as the Doctor. Can Sally unravel their meaning before the Angels claim their prize...? Blink is this year's "Doctor-lite" episode, featuring the main cast only briefly as a necessity of the hectic production schedule. Despite his lack of actual screen time, the Time Lord's presence suffuses the episode through writer Stephen Moffat's clever use of cryptic messages, including writing beneath wallpaper and a recording preserved as a DVD "Easter egg". The plot is a complex wobbly-wobbly, timey-wimey affair (as the Doctor puts it). This keeps the viewer suitably interested and/or baffled, depending on how familiar you are with the time-travel genre in general. For instance, the letter Sally (Carey Mulligan) receives from the past will be instantly familiar to fans of the Back to the Future trilogy. (I know I keep mentioning these films in my Series 3 reviews, but this trilogy is a favourite of mine!) The cyclical nature of the story ensures that the episode stands up well to repeated viewing. Even if the plot confuses you the first time around, Moffat crafts some attractive and sympathetic characters to keep us engaged and entertained throughout. Mulligan successfully carries the show as Sally, and she is ably supported by light relief from Finlay Robertson as the geeky Larry Nightingale. There's more than a hint of Moffat's relationship comedy Coupling as the half-asleep Larry realises he is naked in front of Sally, as Sally makes a fool of herself in front of a man she fancies, Billy Shipton (Michael Obiora), and when Larry is aghast at the fact that Sally owns only 17 DVDs. And then there are the creepy Weeping Angels. Even more so than the scarecrows in Human Nature / The Family of Blood, these creatures, in the grand tradition of the Nestenes, take a familiar, everyday object and make it scary. You may never look at a statue in quite the same way again! Even if you only ever own 17 DVDs, make sure this is one of them. Don't blinking miss it!